...enhances safety at work while minimising risk to your business and your employees! Stretch wrapping around a pallet is accidentally torn and gets stuck in the roller conveyors of a pallet flow lane. Pallet flow is blocked, orders cannot be picked. A conveyor roller somewhere in the roller lane has been damaged and needs to be replaced. Dirt or spills must be removed from components within the pallet live storage racking. Maintenance on brake rollers and conveyor rollers must be carried out. These problems can occur in a pallet flow rack which means that staff has to climb into the racking lanes to carry out the necessary work at the trouble spot. But how to climb into a pallet flow rack without risking injury or accident? The Pallet Live Storage (PLS) Access Kit from BITO puts a stop to health and operational safety issues! The Pallet Live Storage Access Kit provides secure racking access for troubleshooting, repairs and maintenance (e.g. on the FlowStop load separator, brake rollers, conveyor rollers, in-feed guides etc.) as well as for component cleaning. How does the Access Kit work? Select a safe anchor point for fitting the BITO easyHOOK, lock in the twist-lock carabiner, attach the fall arrester and connect it to your body harness. Place the starting and the intermediate board, then lay connecting boards into the adjacent lane or into the affected lane until the problem area can be reached. In the event of a disruption, the trouble pallet can be easily reached via the adjacent lane which has been covered with starting, intermediate and connecting boards. Use the pallet blocking device to prevent trouble pallets from moving down the lane unexpectedly, thereby potentially hitting a person. Properly secured by the access kit consisting of the BITO easyHOOK, a twist-lock carabiner, a fall arrester and a safety harness, the assembly person will be able to remove obstacles in a lane without any safety hazard. The same applies for repair work, f. ex. on damaged conveyor rollers or brake rollers. After all pallets have been removed from the lane in which the fault has occurred, a properly secured assembly person can safely move up to the lane via a maintenance platform and walk into the lane on the access boards. Removing dust, dirt, liquids and other impurities as well as foreign objects (e.g. packaging film) is just as easy with the PDS Access Kit. The place to be cleaned can be conveniently reached via the access boards. Proper maintenance has a great impact on product quality, the working atmosphere and upcoming audits. Use a maintenance platform or a scissor lift table to access the affected racking lane. Secure yourself: Put on a safety harness. Select a safe anchor point and insert the easyHOOK into the upright slotting and connect a twist-lock carabiner. Open the maintenance platform door, place the starting board on the conveyor rollers of the racking lane. Never enter an affected lane. Swing the activator of the FlowStop load separator to the side and secure it with the holding device. Position the intermediate board against the yellow stopper of the load separator. Place connecting boards into the lane until you reach the trouble point. When walking into the lane, always secure yourself to the nearest upright using the easyHOOK and the twist-lock carabiner. removing obstacles that prevent pallets from moving down a lane and for general troubleshooting within a pallet flow lane. carrying out repairs and maintenance in the affected lane. cleaning roller lane components such as conveyor rollers. Compliance with the latest rules and standards: Our course of action for dealing with downtime situations in pallet live storage racking has been assessed and recommended by the BGHW (German statutory accident insurance carrier for insured persons and companies in distributive trades). Three different types of boards are required for walking into a roller conveyors lane: 1 starting board, 1 intermediate board and, depending on lane depth, an adequate number of connecting boards. A lane that accommodates 10 European size pallets handled long side on needs 1 starting board, 1 intermediate board and 9 connecting boards. This means you need 1 starter kit plus 4 add-on kits. Personal fall protection equipment must be inspected at least once every 12 months by a “competent” person (cf. national standards and regulations) as stipulated by EN 365 in order to ensure user safety. 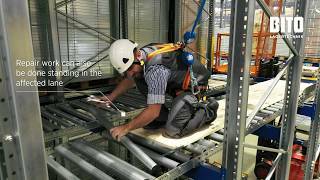 Personal fall protection equipment includes: BITO-easyHook (DIN EN 795), twist-lock carabiner (DIN EN 362), body harness (DIN EN 361), fall arrester (DIN EN 360), hard hat (DIN EN 397). A competent person is someone who has the necessary skills, experience and knowledge to assess workplace safety and ensure the proper use of PPE. By German standards, a suitable person must have completed a course on the assessment of personal protective equipment and rescue equipment (cf. DGUV-Grundsatz 312-906) and passed the subsequent examination in compliance with DGUV 112-198. Be sure to check your national regulations and laws! Approved PPE training courses are offered by various service providers and take 2 days. This only applies to a limited extent to complex equipment such as the fall arrester: Since special knowledge on health and safety at work is required for disassembling, assembling and assessing the equipment, safety inspections must be carried out by a person authorised by the manufacturer. Access Kit components not mentioned here (e.g. boards used for lane access, holding device for the FlowStop load separator, etc.) do not need annual inspection, because they are not part of the personal fall protection equipment. If you do not have the time or the trained personnel for the annual Access Kit inspection, we will be pleased to assist you. Our safety partner A.J.P. will be pleased to carry out professional PPE inspections for you in compliance with all requirements.